Please read and familiarize yourself, and/or your booth host with the TELUS Convention Centre’s building regulations. Violations of the building regulations are subject to action by TELUS Convention Centre staff, their contractors from St. George Show Services, Calgary Police Services and/or the Calgary Fire Department. All booths include 12 linear feet of tables. If you require a specific combination, such as 2 6-ft tables, one 8-ft and one 4-ft, extra tables or no tables, please download the St. George forms found under the Exhibitors menu. For any additional materials/services you may require, including those organizations storing materials for the Palliser Convention you need to complete these forms. At the request of the Calgary TELUS Convention Centre and in consultation with CCTCA committee members, exhibitors will no longer be able to prepare and serve popcorn to delegates effective Convention 2016. Questions regarding booth set-up order forms can be directed to Peter O'Dwyer at 403-261-8575 or petero@calgary-convention.com. St. George Show Service forms for 2019 can be downloaded HERE. Exhibitor Catering Order Form and Credit Card Authorization - Catering Services by the Calgary Marriott Hotel. This form is also to be used if the exhibitor wishes to hand out food/drink samples i.e. water, bottles, chocolates, or ice cream bars. 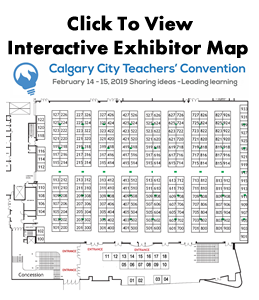 If you also have a booth at the Palliser Teachers' Convention and would like to have your materials stored, please use the form that is available HERE. Exhibitor Catering Orders – please contact Gabriela Palacios Catering and Sales Office at 403-231-4531.